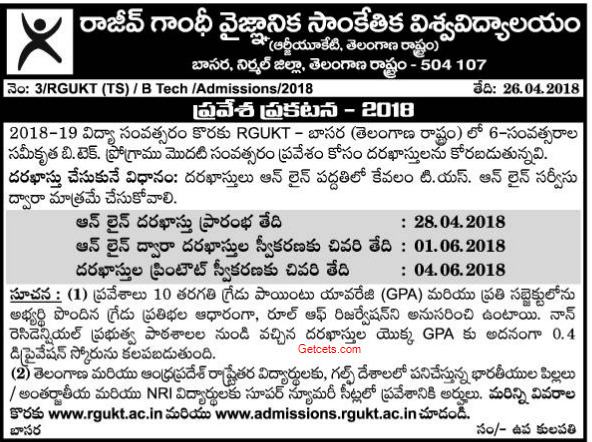 Basara IIIT notification 2019-2020, TS Rgukt apply online, admissions : The most awaited notification for the admissions in the Rajiv Gandhi University of Knowledge Technologies located at Basara had been released by Telangana IIIT Basara admission notification 2019. The Rgukt had released the ts iiit notification on its website for the session 2019-2020. The notification clearly contained all important details, basar iiit application form 2019 last date, fee structure and iiit basar selected list pdf. To know the important details required to apply for the ts iiit admissions check below. a) Regular students who passed 10th class/SSC or its equivalent examination held in March 2019, in the first attempt. b) Age of Candidate not more than 18 years as on 31st Dec 2019 (21 years in case of SC/ST candidates). a) The receipt issued by the TSOnline services (see 2(c) above). b) Hall Ticket of 10th Class or its equivalent. c) Study Certificates from Fourth class to Tenth class/ Residence certificate by those claiming Local category (in any of Osmania University areas (Telangana State), (for details, see Annexure – III). d) Residence certificate / service certificate of parents by those claiming un reserved category of seats (for details, see Annexure – IV). e) Proof of caste / community certificate (SC/ST/BC) in the prescribed proforma by those claiming reservation under any of these categories (for details see Annexure -V). f) Physically Handicapped (PH) certificate in the prescribed proforma by those claiming reservation under this category (for details see Annexure – VI). g) Children of Armed Forces (CAP) certificate in the prescribed proforma by those claiming reservation under this category (for details see Annexure – VII). h) NCC certificate by those claiming reservation under this category (for details see Annexure – VIII). i) Sports certificate(s) at the level of inter-district and above by those claiming reservation under this category (for details see Annexure – VIII). Admissions to 6-Year integrated B.Tech Program Admission Schedule of TS RGUKT Basara IIIT for 2019-20 is as follows. Applied candidates can check their list of selected candidates in the official site http://admissions.rgukt.ac.in. The authorities will release the Basara Rgukt IIIT result 2nd week of June. Students can check their name in the Rgukt IIIT Basara selection list. Please provide the following details in your email: Your name, Hall Ticket, Mobile Number, RGUKT Application ID, and a brief outline of your problem. Candidates can check Basara IIIT notification 2019, TS Rgukt apply online, iiit basara admissions 2019-20, iiit basara website, iiit basara notification, iiit basar selection list, iiit basar results 2019, rgukt basar results, rgukt basar admissions 2020 through this article.